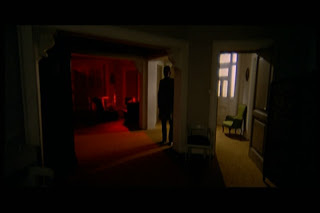 In “All the Colors of Darkness” (1972), Sergio Martino tries to combine the giallo with an occult tale, similar in ambition to Argento’s superior “Suspiria” (1977). It’s the weakest entry in Martino’s two-year 1971/1972, four-film streak of giallos, though not without its merits. The ultimate giallo pairing of Edwige Fenech and George Hilton (last seen in “The Case of the Bloody Iris” from the same year) provides a solid character base around which to construct the story. Sadly, the story hardly goes anywhere and the plot stretches believability even beyond Martino’s usual twisty logic. Jane Harrison (Fenech) is the mentally fragile wife of Richard Steele (Hilton). Richard is remarkably insensitive to Jane’s recent trauma involving a car accident that killed her unborn baby. 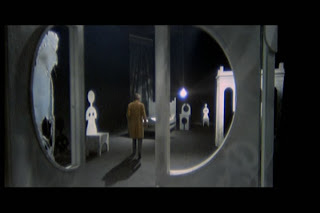 The film opens with one of Martino’s trademark creepy dream sequences. 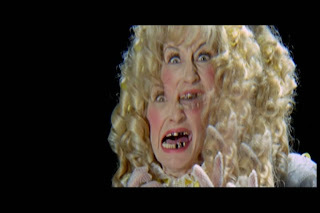 Inside Jane’s head, we get a wacked out schoolgirl with golden locks, a mother dying in childbirth, some crazy quad-fragmentation and the requisite knife stabbing finale. 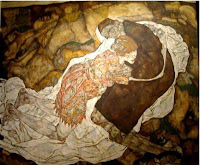 It sets up yet another set of Freudian themes to be worked out and draws connections to other “crazy protagonist” giallos like “Lizard in a Woman’s Skin” (1971), “Phenomena” (1985) and “The House with Laughing Windows” (1976). The opening imagery is a recipe for instant revulsion, but fear not: Martino shifts from alienation to exploitation within minutes with an Edwige Fenech shower scene. Jane suffers another nightmare and it quickly becomes clear that Jane needs serious help. Fortunately, absolutely everyone has a suggestion. These range from dismissive (Richard keeps saying she just needs rest) to practical (her sister Barbara, played by Susan Scott, suggests seeing a psychiatrist) and from questionable (her neighbor Mary gets her high on drugs) to psychotic (attending a satanic mass). This last suggestion, also made by Mary, hardly causes Jane to bat an eye. Soon it’s a date. Why Jane would think a black mass would help rid her of “visions” of a creepy stalker (complete with bad blue contact lenses) is difficult to answer, especially since it turns out she is actually being stalked. However, this twist shatters any reasonable continuity and believability, since it would require the stalker to read her mind, be coincidently at the right places at the right time on half a dozen occasions and teleport. Jane hardly gains peace of mind as the result of her visit to the cult ceremony, and it doesn’t prevent her from being stalked by the same crazy psycho. As the suspense escalates, Jane is put into a position where it’s hard to know whom to trust. Here, as in many giallos, the answer turns out to be pretty much no one. Fenech manages decently in the thankless role, playing troubled, confused and victimized with all her might. It just goes on too long to work. Where Sergio Martino stumbles most is in the story department. Not only is the plot uneven in itself, but the character motivations and internal logic just doesn’t make sense. The pacing is also lacking; almost all the action in the first half is stunted by false starts and it isn’t until the second half where the tension and mystery starts to build. Lastly, the mystery cheats now and then to keep you from solving it, but without delivering a twist worth all the secrecy. 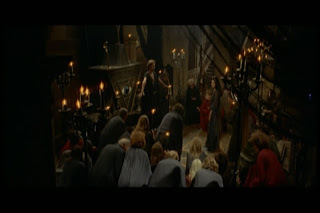 The film does soar in terms of camerawork and overall style. 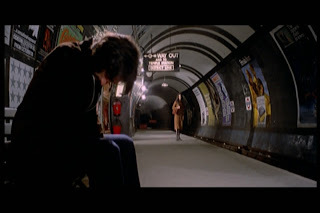 The visual expressivity is often times given full attention and allowed to dictate the pacing, blocking and mise-en-scene. The composition in almost every scene is stunning, and helps distract from the lagging story and extraneous dialogue. Martino goes absolutely nuts with his always-impressive deep-stage framing, including shots through a fireplace and a harp! 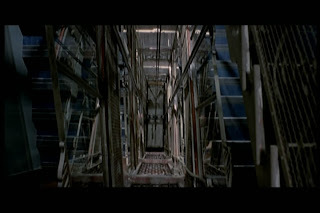 The location scouting and set design are also wonderful. The beautiful estate that houses the satanic cult works as brilliant contrast to the dark deeds done within. 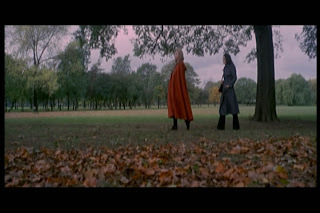 All the scenes outdoors make use of the autumn season, but much of the credit goes to Miguel Fernández Mila and Giancarlo Ferrando’s crisp cinematography. The London apartment complex where Jane and Richard live has a rectilinear spiral staircase and a creaky elevator, ripe for vertical chases and scares. 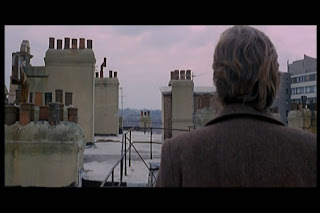 Best of all, the roof is festooned with chimney’s perfect for a climatic action scene that looks like an evil twin of the rooftop musical number of “Mary Poppins” (1962). 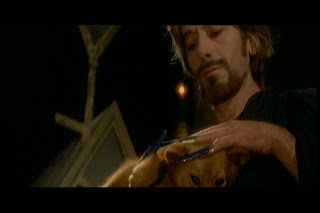 “All the Colors of Darkness” is not Martino’s best work, but most of the slack is probably the fault of screenwriters Ernesto Gastaldi and Sauro Scavolini. If you are the type of viewer that requires to story, continuity and logic, you might want to skip this one. But if you’re fine with using an averagy supernatural mystery as an excuse for senseless thrills, photography as pretty as the girls and amazing focus pulls, you won’t be disappointed. Very kind of you to say so. 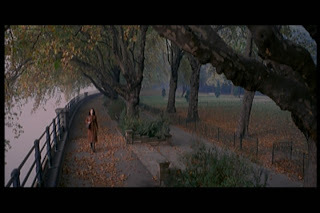 The movie helped quite a bit considering that it is so visually rich and resplendant. The shame is that the rest of the movie (story, characters, acting, etc) couldn't have delivered as well. "All the Colors of Darkness" had me scrambling to write down times for screenshots about every two minutes! I thought "your vice is a locked room..." is far worse. 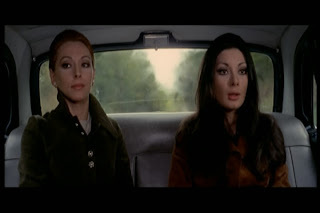 I'm also quite surprised that you didn't focus on Hilton's character more, who seemingly serves as the hero, but behaves in ways that are raher obnoxious even for a "Giallo lead" - cheating on Jane/Fenech with her sister (after she lost their baby no less) and later killing her sister in cold blood, etc. I always felt this is vintage Martino - the good guys are just as bad as the bad guys, if not worse - whom I consider to be the most political (albeit in rahter abstract ways) of the 70's giallo makers. I think your right that this is "vintage Martino" for several reasons. The visual sumptuousness and breakneck glee of the strange scenes, dream sequences, occult events, camera flourishes and kills definitely show that Martino and crew were having a great time. I might shovel some of the blame for not liking it on the writing, since the plot and dialogue struck me as scribbled and generic when not outright bad. There is a good positive review on Giallo Fever. One day I'll rewatch the film and see if my score goes up.